producers with an efficient nutrition resource. 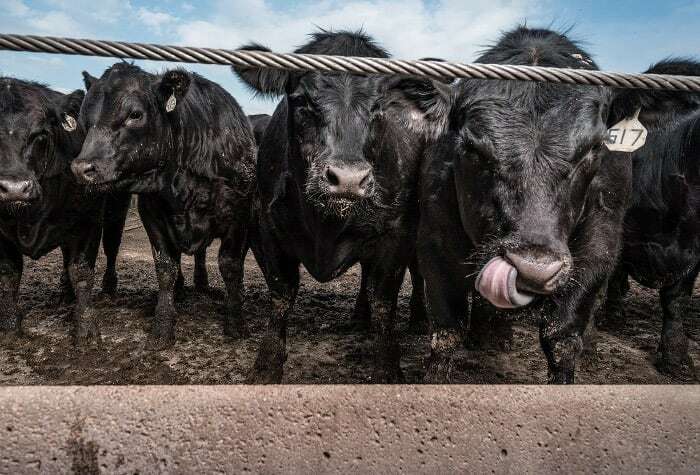 These black angus cows experience more readily available energy as a result of eating Enogen Feed corn. When Duane Kimball started raising Enogen® corn four years ago, he wanted the premium he could earn from a local ethanol plant. When he started growing Enogen Feed hybrids for his beef cattle this past year, he became even more convinced of the technology’s value. “Enogen products are a win-win for ethanol and feed,” says Kimball, who has farmed full-time for 21 years in central Nebraska, near Callaway. Today, he runs 200 cow-calf pairs and backgrounds or grows steers and heifers from weaning until they enter the feedlot. He feeds his cattle Enogen Feed corn from wean through finish and has also grown Enogen Feed silage. University research shows Enogen Feed corn can boost feed efficiency in cattle by an average of 5 percent.1 Duane Martin, Ph.D., commercial traits manager for corn and soybean product marketing at Syngenta, has seen the data—and the results—firsthand. During the early 2000s, Syngenta researchers studied ways to modify corn to carry a specific amylase trait that helps convert starch to sugar more efficiently. The original goal? Provide corn hybrids that enhance ethanol production efficiency. “The faster the starch in corn breaks down into smaller, simpler sugars, the better,” Martin says. Enogen hybrids store this special amylase in the corn kernel’s endosperm, ready to be activated when triggered by conditions in the ethanol plant, the animal rumen and/or the silage bunker. 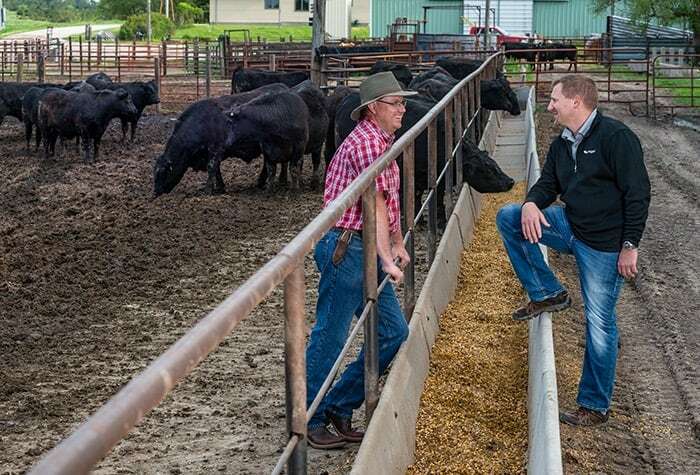 Enogen Engergizes: Corn and beef cattle producer Duane Kimball (left) from Callaway, Nebraska, discusses the benefits of using Enogen corn hybrids with Easton Eggers (right), a grower account lead at Syngenta. Enogen Energizes: Kimball loads Enogen corn into his planter during the 2018 planting season. Enogen Energizes: Enogen Feed corn provides Kimball’s beef cattle with an efficient nutrition source. Enogen Energizes: Enogen grain pours into a grain cart on Kimball’s farm. Enogen Energizes: A payloader fills a mixing wagon with Enogen grain on Kimball’s farm. “I appreciate how Syngenta goes the extra mile to substantiate the science,” says Blasi, who has also conducted Enogen Feed silage research. Enogen Feed corn silage also interests Randy Shaver, Ph.D., a professor of animal nutrition and extension dairy nutritionist from the University of Wisconsin–Madison. “In addition to the improved starch digestibility and higher levels of available sugars, there’s also an improvement in fiber digestibility with Enogen Feed corn,” Shaver says, who has been working with Syngenta since 2016 to study the feed efficiency of Enogen Feed silage and dry corn. The variation around this average digestion is substantial, with figures ranging from 50 percent to 75 percent, Goeser adds. “Improving these numbers could have big benefits,” he says. Syngenta also plans to expand Enogen Feed corn research into swine and poultry in the next few years. Eggers welcomes opportunities to have more data on the potential benefits of feeding Enogen Feed corn to livestock. 4. Enogen growers must comply with specific yet simple stewardship requirements.